Manufacturing and downstream industries are being stimulated by foreign investment in a Special Economic Zone. “The future of Limpopo Province looks bright,” says Limpopo Economic Development Agency CEO, Ben Mphahlele. He adds, “As we continue to position our integration with other provinces for efficient transit of goods and commodities, increase the quantity and quality of water resources to households and the industrial sector, the multiplier effect becomes enormous. Since his arrival at LEDA two years ago, Mphahlele and his executive team have made it a priority to have the permit application for Limpopo’s first Special Economic Zone (SEZ) approved. Together with the National Department of Trade and Industry an enormous amount of work was done, with the result that the Musina-Makhado Special Economic Zone is now a reality. 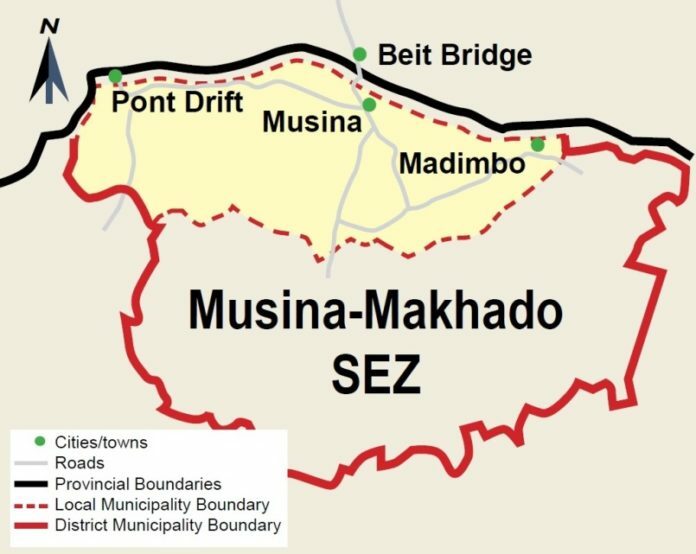 Located in the far north of the province, the Musina-Makhado SEZ is a very attractive investment proposition and it has the potential to transform the provincial and regional economy. The SEZ is surrounded by areas of great mineral wealth and lies along major transport routes such as the N1 that connects South Africa to Zimbabwe through the Beit Bridge. The SEZ has already attracted considerable investor interest, particularly from China. Ten Chinese companies recently signed Memoranda of Understanding (MoUs) with LEDA, followed by site visits, meetings and workshops. These developments point to increased connections between nations in the BRICS grouping. MEC Seaparo Sekoati with potential Chinese investors. Whereas South Africa generally has inadequate capacity in coke production, the Musina area has an abundance of coking coal, a component in the manufacture of steel and iron. The plant will produce coke and energy for consumption by adjacent industries. Downstream companies will expand production in response to the requirements of the coke plant. A planned logistics hub is a critical component of the SEZ. It will house value-added manufacturing companies. The container terminal (which stores and refrigerates fast-moving consumer goods for export and import) is a key tenant. This will increase the range of products that can be manufactured in the SEZ, and package and process them for distribution to markets. It will also provide sophisticated and secure storage for incoming goods that will be sorted for distribution. Manufacturing in Limpopo Province in 2016 stood at 2.3% of GDP. The provincial economy is characterised by primary production of commodities. The light and heavy-manufacturing component of the SEZ, whose incentives are focused on value-added production companies, will scale up beneficiation of products for local and export markets. The iron and steel output of the metallurgical cluster at the SEZ will reduce the cost of steel and iron. This will make these inputs more affordable for local manufacturers and assist them to scale up their manufacturing efforts. The milestones achieved so far under the stewardship of CEO Mphahlele are considerable and point to a sense of optimism and a forward-looking policy in terms of promoting trade and investment. The Council for Geoscience and Department of Mineral Resources report that 50% of South Africa’s remaining coal reserves are in Limpopo Province and 43% of that is in the Waterberg Coal Basin, amounting to 75-billion tons. In terms of Platinum Group Metals, South Africa is the largest producer, with 41% of reserves found in Limpopo. Platinum is an important resource to produce catalytic converters and fuel cells to reduce emission for environmental management. Nitrogen gas, a by-product of platinum, is consumed in both industrial and domestic environments. Investment promotion for the traditional mining sector with a view to beneficiation is at the heart of LEDA’s investment promotion strategy. Limpopo Province is home to the primary production of agriculture cash crops, with tomatoes accounting for the biggest share. The envisaged logistics hub in the Musina-Makhado SEZ will provide a facility for processing, packaging and distribution for both the SADC and overseas export markets. Light and medium manufacturing industries have the potential to attract investors for beneficiation of these agricultural products. Collaboration of businesses in the SADC region will be vital to this enterprise. LEDA recently sponsored a business seminar organised by the BRICS Business Council’s (BBC) financial working group. The two-day seminar targeted organised business to provide a platform for networking and to find out about challenges faced by business in the province. The inputs and feedback generated will shape the policies of the BRICS New Development Bank on developmental funding. The seminar happened just a few weeks ahead of the BRICS Summit in Johannesburg. Key resolutions included BBC inviting the New Development Bank to present its mandate and funding requirements to the Provincial Government, and to request the BBC to lobby the national government to take its various initiatives to all provinces, including Limpopo.